It's 1970; American involvement in the long war in Vietnam is waning. Air Force NCO Sam McLaughlin reports to his new assignment at Charleston AFB, South Carolina where he is assigned as a crewmember on the Air Force's newest transport, the gigantic C-5A Galaxy. Twenty-four year old Sam has spent the previous seven years of his life in an environment practically devoid of women, particularly young, single women. He arrives at Charleston to discover that he is something of an anomaly since he is single and has never been married. His squadron has no rooms in the barracks so he is assigned to a room belonging to another squadron. After years of having very little time at his home station, he finds himself there most of the time. While attending the on-base C-5 training course, he starts hanging out in the NCO club with other recent overseas returnees who, like him, are bored and seek the company of others like them in the club cocktail lounge. After several months of this life, he decides to move off base into an apartment just outside the main gate. 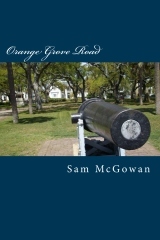 Through another squadron loadmaster, he learns that there are complexes "west of the Ashley" that are home to large numbers of young, single women, mostly recent college graduates who have moved to Charleston for jobs and the pursuit of their MRS.
Orange Grove Apartments turns out to be an entirely new environment for Sam, whose previous experiences with women were encounters with Air Force women in his previous assignment overseas and while living on base at Charleston. He's still flying but less frequently and there is plenty of time to party, and there are parties aplenty right there in the complex. He's also started work on his commercial pilot's license at the airport at Summerville and soon buys an airplane.The airplane turns out to be something of a "chick magnet." Yet although he's surrounded by a sea of eligible young women, he can't seem to make a solid connection with any of them. He has plenty of female friends but they are just that, friends, until one day he has a chance encounter with a neighbor he knew only casually. Marybeth Addington is one of three Baptist College students who moved offcampus in their junior year. Although Sam and Beth had a brief encounter in the parking lot that sparked interest for both parties, it isn't until nine months later that they finally have the encounter that changes both of their lives and also affects the lives of her roommates.